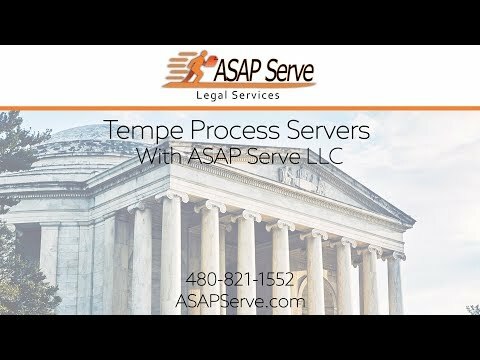 You are most likely to require the service of quality Tempe process servers if you are involved in a legal case that requires delivery of important documents or summons. In spite of the presence of many process servers in Tempe, it is not very easy to choose the best option for the job. Do not choose your process server in haste because there are many essential qualities that need to be checked while making a decision. Take your own time to opt for the best because it will have a serious impact on the outcome of the legal process. Any efficient process server would try his/her best to ensure that the first attempt to deliver the documents is made within three days and the papers are served within five days from receiving the case. Many people work really hard to evade process servers because they do not want to be served. This is why you require a company that maintains high quality of service to make the entire process easier. The service from your preferred process server in Tempe must be able to track down target individuals, providing locating service, an even providing nationwide service if the target person has left the state of Arizona. The greatest of Tempe process servers would never give up if the target individual is not available in the address where he/she is supposed to be found. Many advanced process server agencies in Tempe use advanced technologies to provide more efficient service to their clients. This is exactly the type of company that you should look to appoint for your process serving requirements. Before hiring any process server ask them if they can provide additional services like onsite inspections, extensive searches, or nationwide serving. Conduct a local research to find out which process serving agency in Tempe has the best turn around time. This is one of the most crucial aspects of service offered by the process servers. There are many of them in Tempe who make sincere efforts to ensure rapid progress of the case. Finally, the cost factor is also a point that requires thorough consideration. Depending on the case, the fees charged by process servers can vary significantly. Always remember that choosing the cheapest option may not be the smartest decision. Hiring a cheap and inefficient process server could seriously affect the outcome of the legal process, and you may eventually end up paying much more in the future.